This all steel heavy duty Interior Cargo Rack is perfect for increasing the interior carrying capabilities of the 2018 Jeep JL. The rack is located behind the rear seat creating a double deck storage area. The deck area of the rack is 22 inches above the floor and provides an additional 4 1/2 square feet of flat storage space. The three-piece design is constructed of steel plate that bolts to existing interior holes for an easy no drill installation. 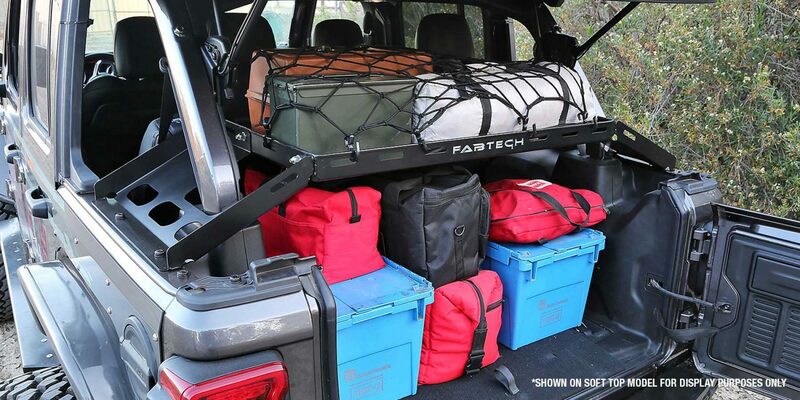 The rack provides a cargo carrying capacity of 150lbs. with rattle free operation. Multiple slotted holes on the perimeter of the cargo rack tray allow the use of tie down straps, bungee hooks or rope to properly secure cargo. 191. Designed for hard top models. Rack does not allow soft top models to fully retract.